Replacement filter pack for the Aquasana Countertop Water Filtration System: AQ-4000. 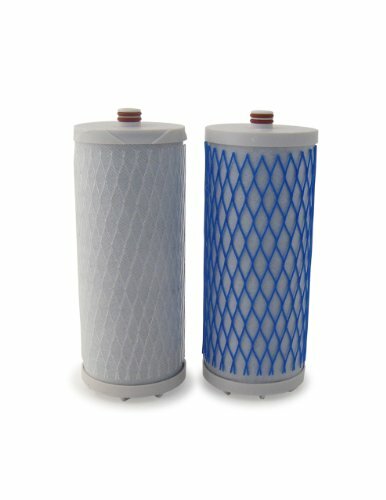 Includes both filters needed for replacement (2-pack). The AQ-4000 Aquasana countertop water filter is the most economical way to get clean, crisp, healthy water for your family. Named one of Health Magazine's Healthiest Gadgets for 2011, our countertop drinking water filter offers Aquasana's unbeatable drinking water filtration technology in a convenient, portable package. There's no need for an extra hole in your sink to enjoy healthy, filtered water. Simply attach our diverter to your existing tap, and the countertop unit takes up just a small space on your counter. Water under pressure means better filtration. Some water filter systems strip out the healthy minerals leaving you with zero calcium, magnesium and potassium. The Aquasana water filtration system is uniquely designed to remove pollutants, reduce odor, and improve taste while preserving healthy minerals for optimum hydration. Full system NSF certified to Standards 42, 53, 401, +P473 to remove 77 contaminants including lead, mercury, pesticides, pharmaceuticals, and more. Will not leach contaminants back into your water.